Daring Fireball: Why Do Websites Publish AMP Pages? Why Do Websites Publish AMP Pages? Can someone explain to me why a website would publish AMP versions of their articles? They do load fast, which is a terrific user experience, but as far as I can see, sites that publish AMP pages are effectively ceding control over their content to Google. Here’s an example I ran into today. I wanted to read Ron Amadeo’s review of the Google Pixel at Ars Technica. From my (new) Google Pixel, I searched for “ars pixel preview”. 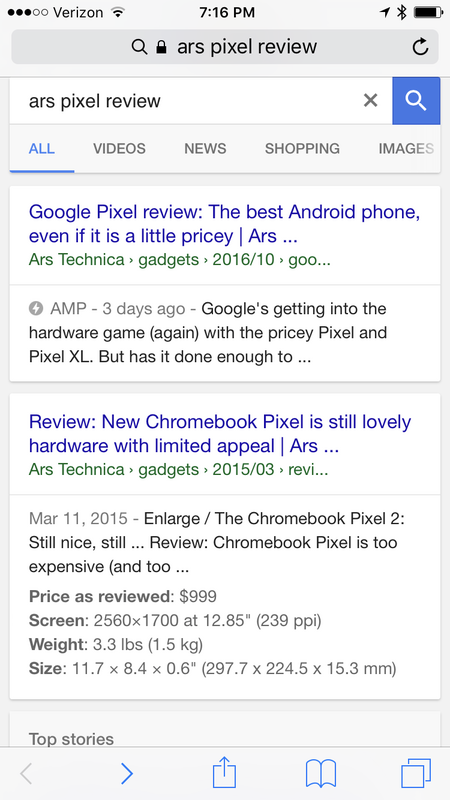 The first search result was the AMP version of his review. Same thing on my iPhone. 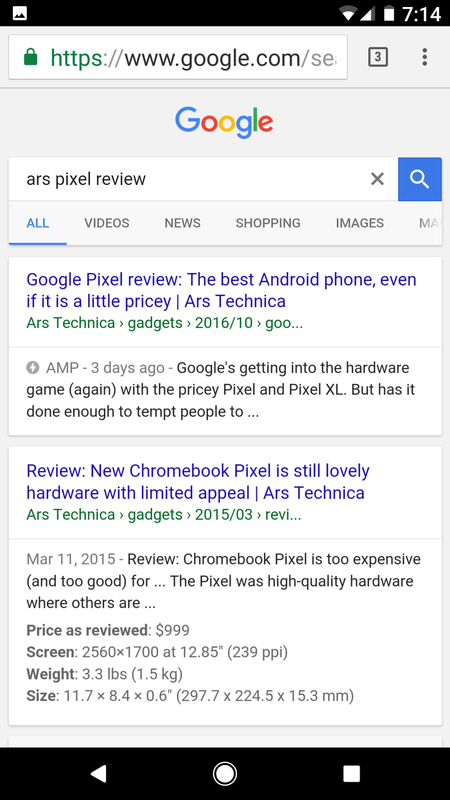 If I tap the result, I get the AMP version of the Ars article, served from Google’s domain. So far, I get it. But the kicker is that I don’t see any way to get from the AMP page Google is serving to the canonical version of the article on Ars’s website. Even if I share the article, what gets shared is the google.com URL (https://www.google.com/amp/arstechnica.com/gadgets/2016/10/google-pixel-review-bland-pricey-but-still-best-android-phone/). On desktop browsers, these URLs do get redirected to Ars’s website. But on mobile they don’t. Share from one mobile device to another and nobody ever leaves google.com. Why would any website turn their entire mobile audience — a majority share of their total audience, for many sites today — over to Google? Update: “Request Desktop Site” in both Mobile Safari and Chrome will switch you to the actual website. Good to know, but I still say AMP traps mobile users onto google.com.